The sun sends 16 times more energy to the earth every day than we use in a year. 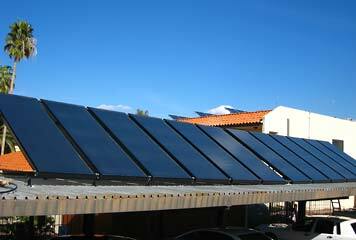 It is the primary source of energy for the planet, and using the sun is the most efficient way to heat water. Using the sun's energy to heat water is one of the most direct ways to take advantage of renewable, pollution free solar energy and a solar thermal water heating system features the quickest "payback" time. 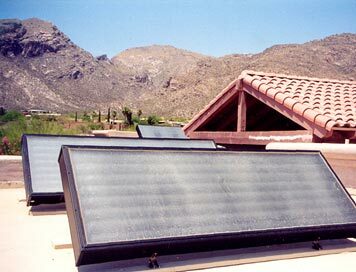 Solar hot water systems can be placed on many different types of roofs including tile, shingle, metal, and built-up reflect. Various hot water heaters can be used including regular hot water heaters, tankless systems and recommended solar tanks. 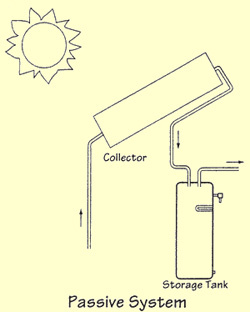 To install a solar water heater system, you will need to have a relatively unobstructed (unshaded) South-facing area on your roof or on the ground to mount the collectors. 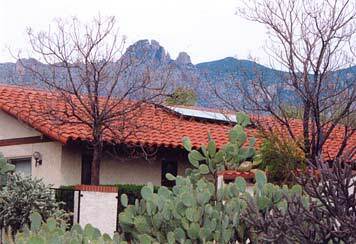 Generally, systems are installed from where your current hot water is to the solar panel on the roof. These systems have no mechanical parts. They use gravity, water pressure and/or convection to create movement in the system. 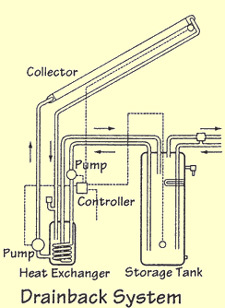 These systems include mechanical components, using a pump and a solar controller to create an active system. Why Solar Domestic Hot Water (DHW)? Provides financial benefits. 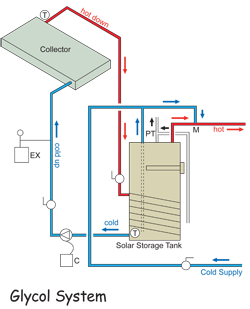 Domestic hot water heaters are the only appliances that pay for themselves; all other appliances (e.g. computers, refrigerators, microwaves, etc.) provide a convenience and don't pay for themselves. Is environmentally friendly and improves your health. Solar reduces air pollutants and green house gases, prevents global warming and improves air quality. Due to this reduction, your physical health improves along with that of sensitive ecosystems. Is reliable. Renewable energy, unlike fossil fuels is always available to us. It is not subject to natural disasters nor is it vulnerable to fuel supply shortages and energy price fluctuations. Is sustainable. The planet's fossil fuel supplies are being depleted; they cannot be replenished. Renewable energy is sustainable because it does not use fossil fuels. According to SolarRoofs.com, "...The Los Angeles Air Quality Management has stated, 'next to car pooling, solar water heating is the most cost-effective way to reduce air pollution.' Each solar water heater installed saves about as much energy as an economy car uses in a year..."
Up to two thirds of the system cost can be covered by credits/incentives.